The story of the Little Prince begins when the narrator describes a drawing from when he was a child. 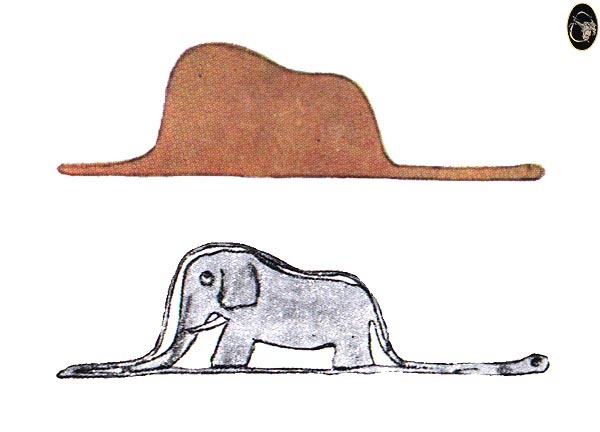 The drawing is that of a hat… or, with a little imagination, is really a drawing of a boa constrictor who has swallowed an elephant. The tale of the drawing is used as a metaphor for adulthood, and its lack of imagination and thought. This is Irene’s favorite book. It is one of the first stories she shares with anyone when explaining why she loves the book so much. Irene has the gift of Intellection, and having never taken the Clifton StrengthsFinder survey, one would hazard to guess it is in her top strengths. As a child, she was a bookworm, eternally interested and observant of the world around her, and the world in her imagination. As a young teenager she was always given credit for being highly intelligent, and sometimes very serious. But Irene to me was never that serious, her humor is just kind of like that drawing of the hat-snake. It takes a little bit of thought and understanding to get it…although she is truly a pun enthusiast. For example, Irene carries a rubber, blue ear on her key-ring. It is her ear-ring. Most, including myself, tend to roll our eyes at such a pun. But Irene loves its simple humor and child-like conception. Irene values the playful joy and imagination that many of us lose as we get older and more jaded by the world around us. Irene uses the hat/snake metaphor as a lens through which she sees the world: a world with more than one answer, a world with seriousness and humor at the same time. Those gifted in Intellection often see the world through many different lenses and greatly value different perspectives. However, much Intellection takes place within. I wonder what would it look like to bring Intellection outward for the world to hear. Irene is one of my favorite people to have a conversation with. She is the first to question something most would just accept. She is a great listener. She loves to hear the full story and grasp a total understanding of a subject. She always has a new perspective to offer. She is a gifted writer. I love reading her essays and stories because I know she gave extreme thought to every word, comma and period. As a student, she has won several scholarships and essay contests, because she is always willing to go back and revise her work. She is not so much a perfectionist as she is an intentionalist. She wants to make sure her words say what she means and that they sound just right. She is intentional and thoughtful. Irene has always been thoughtful. She is the best gift giver I know, and I have always strived to emulate her. Gift giving is one of the most real examples of her Intellection shining through. Irene is good at remembering birthdays. She is well aware six, four, three months ahead that someone she loves is having a birthday. As a highly observant person, she begins thinking up the perfect gift for said loved one. She will spend months, contemplating, planning, and often creating the perfect gift for a friend or family member. She always finds a way to combine the person’s interests with something new she thinks they’ll like or create something that reminds the person of a memory they share. Her Intellection Talent Theme makes her thinking highly individualized. When developed, or developing, Intellection can be extremely interpersonal, and a unique way of making genuine, authentic connections with people. Because people with Intellection talent put lots of thought and care into their words and actions, and find it hard to fake any kind of sentiment. Irene, in high school, was often bogged down by the intense cynicism of the world around her. She gave great thought to the things that were happening in the news, often feeling helpless in that she couldn’t generate a huge change. That feeling led her to decide that positivity will be a priority, which isn’t a common focus for those who lead through Intellection. Skepticism comes more easily. She tackles positivity with the same intentional thought and action that she does anything she is a part of – she makes deliberate and well thought out actions in order to get results. She often journals and makes an effort to find a silver lining when presented with a problem. Now, Irene as a young adult is (still) a driven, thoughtful, intentional activist. She is a service-oriented, successful student enrolled at the University of Texas at Austin. Irene has put so much work into her organization LARA (Liberal Art Refugee Alliance) at UT because it is her way of giving back, and doing something positive in the wake of a crisis like the one refugees face. Her intentional actions to live a meaningful life and make a positive impact are a perfect example of Intellection taking place in the real world. 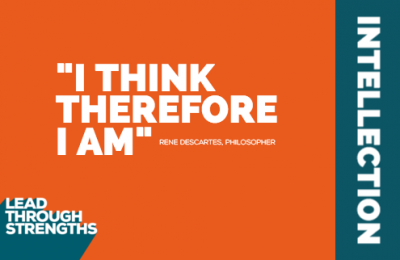 Action Ideas: What does Intellection look like in your life? Consider putting pen to paper (if you don’t already) and share your ideas with someone! You may find it easy to think or write for hours about your observations of the world, but might feel shy about sharing them. Chances are, this world could benefit from finding an elephant in a boa rather than looking at pictures of hats. Talk to someone new. You’ll bring a fresh perspective to their day, and they’ll likely give you a lot to think about later. Needing to refuel or gather new energy for a project at work? Go sit at a cafe and people-watch for a bit. Give your brain the much-needed stimulation of observing others to get your neurons firing and Intellection brewing. Emma Kypuros is the Creative Development Intern at Lead Through Strengths. Through her Strengths In Action stories, she explores how human relationships impact the world. She enjoys writing, cuddling with her dogs, drinking coffee, and eating avocados, in no particular order. She’s a Global Studies Major pursuing work with NGOs. She’s also chasing a writing career, and as you can see from these stories, it’s already in full force. Check out her TEDx talk called “I’m Sorry.” You’ll see a unique perspective on words and their impact on our lives. Her Top 5 StrengthsFinder Talents are: Ideation | Learner | Input | Positivity | Activator. Want To Do StrengthsFinder Training With Your Whole Team? If you’re thinking about doing a virtual or in-person event to kick off your strengths-based culture, head on over to our training page to see if our current offerings are a good fit for you. Until next time, thank you for being part of this powerful strengths movement that helps people unleash the awesomeness already inside them. You’ll receive the full length question each week, along with ideas for running a good conversation (like pulling out strengths from Silent-Sally or Skeptical-Susan who didn’t want to participate in your questions at first). Tell us which email address to send your manager activation training tips to. It’s 12 weeks of strengths conversations you can hold with your teams. Each week, you get a topic for your team meetings and a conversation starter for your 1x1s. Which email address should we send the rest of your training to? The talent theme fields are optional. If you fill them out, they allow us to customize your training content further. Cheers to your strengths! Get this: 65% of employees reported receiving zero recognition for good work in their last year on the job. You don’t have to be part of that nasty stat. Here’s a downloadable packet with 127 ways to appreciate what’s already working with your team members.